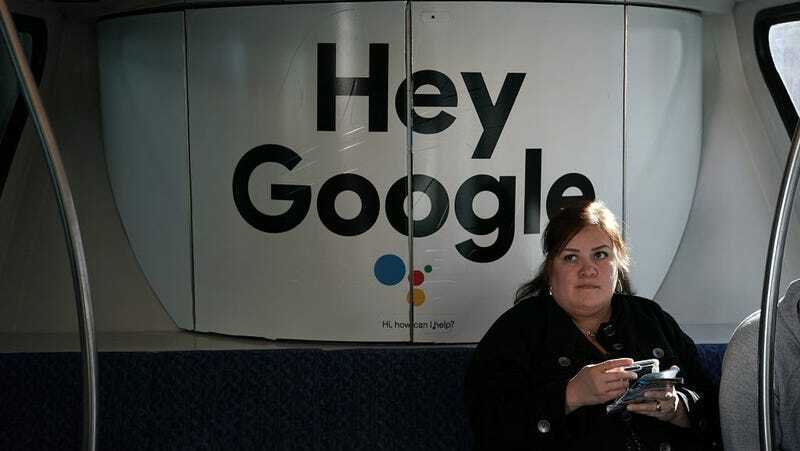 A woman sits in a Las Vegas Monorail car with a Google ad prior to the CES 2018. Counter to preliminary findings in an ongoing Department of Labor investigation and claims made in a class action lawsuit brought by former employees, Google says it has no gender- or race-based wage gaps among its workers. Google has run a wage gap analysis every year since 2012 and started publishing the results in 2016. The company says it found no wage gap in 2016 but discovered a slight gap in 2017, which has been corrected. Google’s analysis included 89 percent of its workforce and takes into account factors like length of employment, location, and performance while looking for what it calls differences in total compensation that might be attributable to race or gender. “We looked for unexplained pay differences by gender and race / ethnicity and made upward pay adjustments, where necessary, before Googlers’ 2018 compensation went into effect. Based on these analyses and adjustments, we have zero statistically significant pay differences,” Google’s pay equity leads Steph Tietbohl and Veronica Gilrane wrote in a blog post. The analysis found “statistically significant pay differences” for just 228 employees and Google provided pay increases to those employees totaling $270,000. Tietbohl and Gilrane didn’t specify how that increased compensation is distributed, but if split evenly between the employees, each would get only an increase of a bit more than $1,000 per year. That’s not much—Salesforce, in contrast, has spent $6 million to close its pay gap. “The 228 Googlers included women and men across multiple countries (e.g., U.S., UK, India) and functions, as well as Black and Latinx/Hispanic Googlers in the U.S. across functions,” Tietbohl and Gilrane wrote. The Labor Department asserted last year that Google had “systemic compensation disparities against women pretty much across the entire workforce” and that those disparities were “extreme.” Google’s role as a federal contractor allowed the Department of Labor to review its pay records for discrimination. In July, the judge overseeing the case limited the amount of employee data the Labor Department can request from Google. “We were taken aback by this assertion, which came without any supporting data or methodology,” Google’s vice president of people operations Eileen Naughton responded at the time. Google is also facing a class action lawsuit brought by former employees who say that the company routinely underpaid women. The suit was narrowed earlier this year to only focus on women in engineering, management, sales, and educational positions.